Let's face it, this whole blog is kind of like a long-distance book club. Every week I look forward to talking to Paige about what she's reading. When I've read that book too we talk about it more in depth. But sometimes, when we are very lucky, we get to read the same book at the same time. 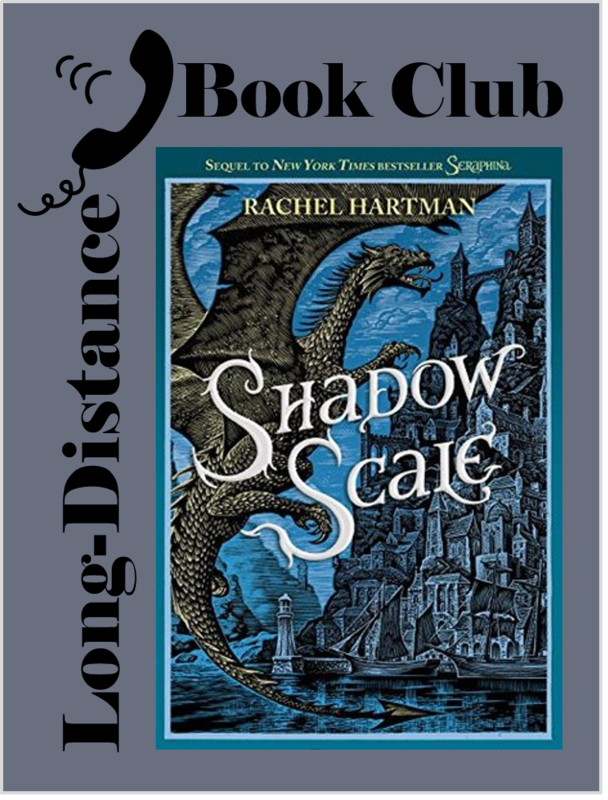 That was the case with Rachel Hartman's Shadow Scale, so we decided to do a little book club post. Our review stems from our discussion of Shadow Scale. Below the review we've provided a list of questions that you can use to discuss Shadow Scale in your book club, long-distance or otherwise. Paige and I both loved Seraphina, the first in this duology. And when I say that I loved Seraphina, I mean that I loved it in a favorite-book-ever kind of way. Seraphina completely blew my mind. It's a five-star fantasy that is unlike any other. Clearly, I was eager for the sequel. Shadow Scale begins about three months after the events in Seraphina came to a close. The dragon civil war is waging. Goredd will soon be swept up in the conflict. In conference, Glisselda, Kiggs, and Seraphina determine that Seraphina should venture to the neighboring lands in order to gather up the other half-dragons. There is evidence that the ityasaari (as the half-dragons are known in other lands) can knit their minds together to create a net that can stop even an army of dragons. Seraphina is eager to go as she has dreamed of gathering the dragons together in a physical manifestation of her mind-garden. Thus begins Seraphina's journey. It's a long journey and so much happens along the way that causes Seraphina joy, pain, terror, and much uncertainty. I loved Shadow Scale. So much. It's a long book and it took me a long time to read it, but when I finished I was so sad that I would be leaving this world behind. I love the intricacies of Rachel Hartman's creation. The other lands are rich and lushly wrought. Many of the characters that Seraphina meets along her way are incredibly interesting. I really liked getting to know the other ityasaari. The bond that was forged between them through shared experiences and sorrows was palpable. And speaking of half-dragons. Jannoula is one of the most terrifying villains ever. She's headed for the top of my most-terrifying-villains-ever list. But my, is she a match for Seraphina in every way. I love a fantasy with a fully realized religion, and so I was quite pleased that the Saints played a bigger role in this installment. Shadow Scale is epic in that it does so much. It has so many settings. So many characters. So much goes terribly wrong. So many things happen to Seraphina and she feels so helpless for much of the novel. There is so much to tie back together at the end. It could be a disaster, but it isn't. It's nearly perfect. All of this is handled with Rachel Hartman's gorgeous prose. The language in this book is incredible. And, as Paige pointed out, Seraphina has a very lyrical voice that is so fitting for a musician. And, at the end of the novel, you get the sense that life will continue for these characters. That we have just seen one story in the whole history of this world. It's nice to know that life there goes on. Shadow Scale takes place in a number of different countries and locations. Which did you enjoy reading about the most? Why? Shadow Scale is populated with a wide variety of characters. Discuss your favorites and why you liked them. How does Seraphina's mission, and her feelings about it, change as she proceeds? Jannoula has secured herself a place on my top ten most terrifying villain's list. Why is Jannoula so scary? What makes a terrifying villain? And do you think that Jannoula is redeemable? The dragons are superbly logical beings. What do the dragons believe they gain by removing emotion from their lives? In what ways does relying solely on logic lead them astray? And speaking of logic, Seraphina speculates that the beginning point of any logical argument may, in fact, be a matter of faith. Do you agree? Are the dragons really less logical than they understand themselves to be? And speaking of dragons, we meet a number of exiled dragons now living in Porphyry in Shadow Scale. Why do these dragons, especially the youth, see the world differently than their fellows? At what point is an exile no longer an exile but a denizen of his adopted land? Why do you think that Seraphina's garden shrinks as she meets more and more of its residents in person? In Shadow Scale we learn much more about the Saints of this world. Discuss the repercussions of learning their true identities. How might this revelation change the world of Goredd and its neighbors? The ending of Shadow Scale leaves some questions unanswered. We certainly get the sense that life in Goredd goes on. What do you think happens next? Shadow Scale was out March 10th, 2015.